[Craig Distl] BURNSVILLE, N.C. - The newest addition to the North Carolina Scenic Byways program begins on the highest peak east of the Mississippi and traverses a national forest, state park, and National Park Service land. The Mount Mitchell Scenic Drive, packed with vistas, roams 52 miles among the peaks and valleys of Yancey and Madison counties. "It's a beautiful corridor for a number of reasons," says Jeff Lackey, manager of scenic byways for the NCDOT. "It has scenic quality, and also a tremendous amount of cultural and historical aspects, which is rare in a byway experience." After an opening five-mile stretch of N.C. Highway 128 in Mount Mitchell State Park, the route heads east on the Blue Ridge Parkway for nearly a dozen miles. From the parkway, it dives onto N.C. 80 for a 13.4-mile descent into the Toe River Valley. The Toe River Valley is the cultural heart of the Mount Mitchell Scenic Drive. It's an area full of artist studios and quilt trails. Some of the best-known glass blowers on the East Coast are located in the Celo community, just off N.C. 80. "When you go around every curve, you'll find something new and interesting," says Wanda Proffitt, a local DOT board member and advocate of the route. The N.C. 80 portion of the drive concludes in Micaville. From there, the byway runs four miles westward into Burnsville, via U.S. 19E. The route passes Town Square - a one-acre green space - and continues down the Main Street of Burnsville, a Norman Rockwell kind of place with plenty of shops and restaurants. The byway's final leg goes nearly 17 miles westward along U.S. 19 to Madison County, where it intersects with Interstate 26. 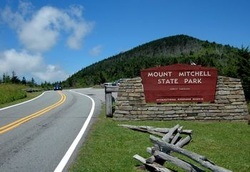 All told, the Mount Mitchell Scenic Drive takes 1.5 hours to drive. It crests the Eastern Continental Divide, bisects the Pisgah National Forest and passes 46 WNC Quilt Trails blocks. For more info, visit the Mount Mitchell Scenic Drive website at http://www.ncscenicdrive.com/, or call (828) 682-7413.